There are still a few more days to play in our "Anything Goes" challenge! 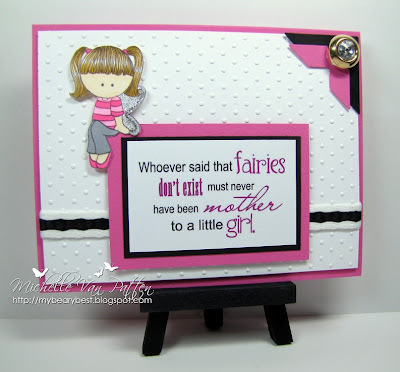 My card features a cutie-patootie fairy from The Digi Garden. Her wings sparkle because of silver glitter liner from Viva Decor. Plus that fab ribbon and gorgeous blinged button are from Martha Pineda's Creating is Fun shop! Have you been over to see the new Digi Set for our very own Party Planner, Jen Scull. This set is being sold to help out Jen and her family during her long battle with cancer. There will be a fabulous Blog hop on August 29. ALL OF YOU are invited to be part of the hop. Find out how HERE. Such a sweet card. I love the image.